We have had several “close calls” in recent weeks related to pick up and drop off of students. Immediately before and after school are particularly busy times on streets surrounding the school. Please take extra precaution when driving in school zones and ensure that students are only being dropped off in designated areas. 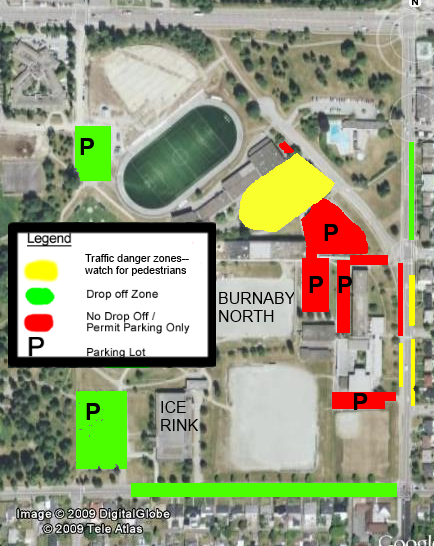 A reminder that drop off is prohibited in school parking lots and along Kensington Avenue adjacent to the school. Thanks for your help! Please check out our Travelling to Campus page for details about alternatives to driving to campus. If you must get a lift to campus, check our map for safe places to get dropped off. The walk to the buildings might be a bit longer, but you’ll get to class on time and the brisk walk will wake you up for your first block! Remember, there is NO PASSENGER DROP-OFF in campus parking lots or driveways.